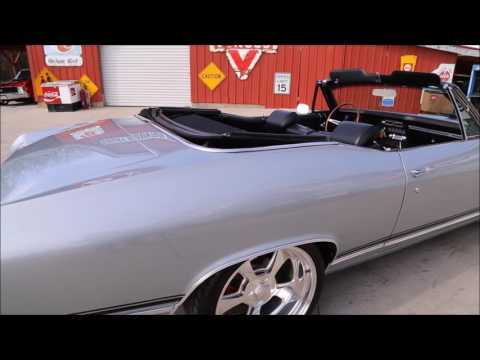 Up for sale we have a 1968 Chevy Chevelle Convertible. We bought this car locally. The previous owner done a frame up restoration and had owned it for 10 years. The body is arrow straight with good panel fit and symmetrical gaps. It has the SS Hood and the Super Sport Badges. The body is covered in the Cortez Silver Paint that's accented by the Black Stripes. Looking close at the paint you will see it has been buffed and polished to a mirror finish. The top on this Chevy is power and we installed a new canvas top with the glass back window.All the stainless and chrome is in great condition with the bumpers having been replaced. To finish off the look it's sitting on a set of 18” and 20” Billet Specialty wheels with New Tires. On the inside, it's done in Black that flows perfectly with the exterior color combo. It has the Black Vinyl bench seats and the seat covers are in good condition. New carpet has been installed along with the seal plates. Looking at the dash you will it has a Tilt Colum with the rose wood sport wheel. The radio has been upgraded to a digital knobbed unit and the Vintage AC works off the factory controls. Under the hood, it features a 454 Big block that we were told was built to 427 specs. It has an Aluminum Intake and Demon Carburetor. This Big block is dressed with aluminum valve covers and matching breather. For options, it comes with Power Steering and the brakes have been upgraded to Power with Four Wheel Drilled and slotted rotors. Also, it comes with Vintage AC and to keep it cool it's fitted with a four-core radiator. The sound comes from the Headers with dual pipes and flow master mufflers. The big block is mated to the four speed trans and a 10-bolt rear end. When you look under it everything has been cleaned and painted. The frame and floors all appear solid with some patch work done to the floors. We are selling this to be a Super Sport Clone. If we can help you in any way with questions or a specific picture, you can call our office at (865)988-8088. Or feel free to call Daniel at (423) 807 0600, Devvin at (865) 256 2366, or you can e-mail us at smokymountaintraders@yahoo.com.